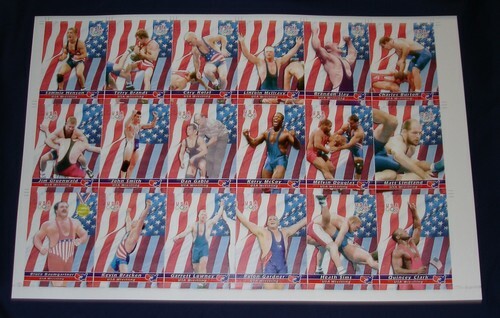 This is the uncut card sheet of the officially licensed card set of the USA National Wrestling Team is commemorates their performance at the 2000 Olympics in Sydney, Australia. It was at the Summer 2000 Olympics where Rulon Gardner had the match of his career. He is most well known for his defeat of Alexander Karelin in Sydney that year. 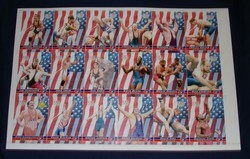 Karelin had been undefeated for thirteen years, and had not given up a point in six years, prior to his loss in the gold medal match to Gardner. Would look great on the wall of any sportsroom or kids room. 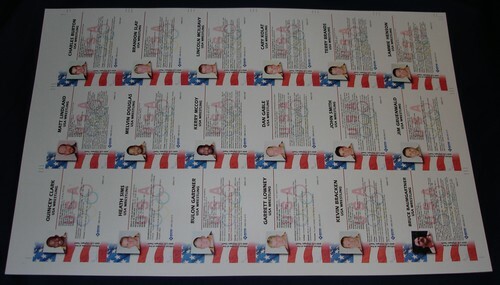 Olympic Trading Cards is not affiliated with the IOC/USOC or any other Olympic sports organization.